Nissan just unveiled its new eNV200 electric concept van at this week's 2012 North American International Auto Show and we were on the scene to witness the reveal, where the automaker cleverly configured one model as a food truck to feed the media. Pictured here are both the model on display at the show and the eNV200 Cheli's Chili chili dog truck that fed the hungry media masses today at the Nissan exhibit. 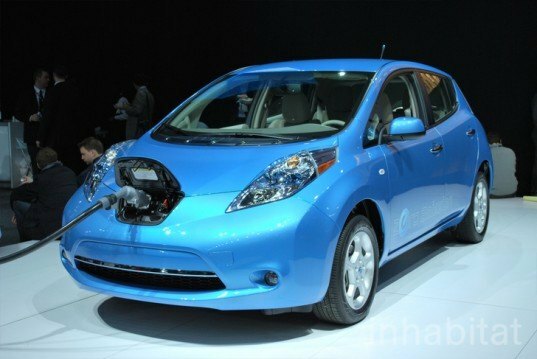 The eNV200 features a 107-horsepower motor and lithium ion battery system based on the Nissan LEAF, plus blue-chrome-plated LED headlights, dual glass roof panels, and a not quite lovely but aerodynamic shape. The idea is to change the way small businesses, large families, and others who use large vans for transport or delivery get around town by offering them the first all-electric delivery van on the market. Nissan has been testing its electric van concept in London with FedEx, making use of the Nissan LEAF drivetrain and a quick-charging system that juices up the versatile delivery vans to 80 percent capacity in just 30 minutes–perfect for a runaround delivery van. As you can see from watching the new film Revenge of the Electric Car, Nissan has bet the farm on electric vehicles, racing to create a full line of eco-friendly vehicles before the competition even wakes up. They have a lot of competition at this year’s Detroit auto show, but they have managed to stay ahead of the pack, offering up a green delivery vehicle while most competing vehicles are still powered with inefficient old gas engines and out-of-date design. Would you buy a Nissan electric cargo van for your business? How about just for the green hauling capacity? Nissan has been testing its electric van concept in London with FedEx, making use of the Nissan LEAF drivetrain and a quick-charging system that juices up the versatile delivery vans to 80 percent capacity in just 30 minutes--perfect for a runaround delivery van. As you can see from watching the new film Revenge of the Electric Car, Nissan has bet the farm on electric vehicles, racing to create a full line of eco-friendly vehicles before the competition even wakes up. They have a lot of competition at this year's Detroit Auto Show, but they have managed to stay ahead of the pack, offering up a green delivery vehicle while most competing vehicles are still powered with inefficient old gas engines and out-of-date design. Would you buy a Nissan electric cargo van for your business? How about just for the green hauling capacity? 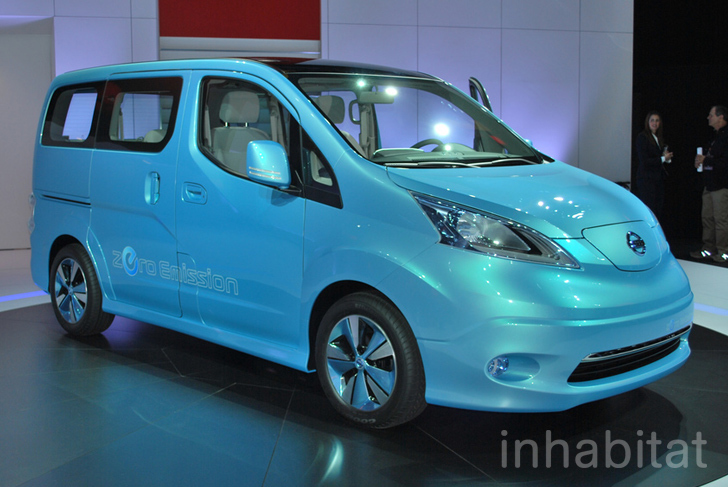 A look inside the Nissan eNV200. The van has a spacious interior and moonroof. Nissan has been testing its electric van concept in London with FedEx, making use of the Nissan LEAF drivetrain and a quick-charging system that juices up the versatile delivery vans to 80 percent capacity in just 30 minutes--perfect for a runaround delivery van. As you can see from watching the new film Revenge of the Electric Car, Nissan has bet the farm on electric vehicles, racing to create a full line of eco-friendly vehicles before the competition even wakes up. They have a lot of competition at this year's Detroit auto show, but they have managed to stay ahead of the pack, offering up a green delivery vehicle while most competing vehicles are still powered with inefficient old gas engines and out-of-date design. Would you buy a Nissan electric cargo van for your business? How about just for the green hauling capacity?